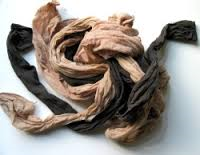 When your pantyhose have runs and tears in them, don’t throw them away. Someone somewhere will have a use for them. Here are twenty useful ways to recycle them. 2...Store onions in the legs of your pantyhose. 8...If you drop something small on the floor and can’t find it (such as an earring, button, etc), cut the leg off some old pantyhose and put it over the nozel on the vacuum cleaner. The suction will lift up the lost object and leave it stuck to the pantyhose. 10...Cut the legs off and use to keep all those odd bits of soap that tend to get left in the bathroom. Tie the end and keep it beside the sink for hand washing. 11...Put cat litter in a pantyhose leg and tie the top. This is good for absorbing damp. 14...Keep spare, or used rolls of wallpaper in the legs of old panyhose. It stops them from tearing and helps keep them clean. 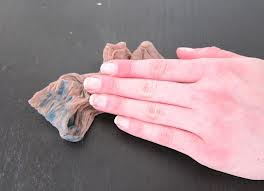 15...If you cut them into strips you can save money on cotton balls for removing nail varnish. These do the job very well if you dip them into your favourite remover. 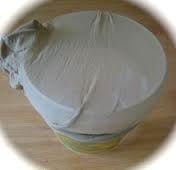 16...When repotting your houseplants put a circle of pantyhose in the bottom of the pot before filling it. This stops soil being washed out of the bottom each time you water. 17...Clean your fish tank. If you have one of those wet and dry vacuum cleaners (don’t try it with an ordinary one! ), use the method above to vacuum the gravel in the tank. You will be able to clean it without emptying, or disturbing the fish. 19...Use old pantyhose to hang dry sweaters. You don’t get peg, or line marks on them this way. Just thread them through the arms and tie them to the line. 20...In the garden you can store flower bulbs in the same way as above. They will get a good circulation of air and will be protected from mice and other creatures looking for a tasty snack.